This is the article on diamonds from the Encyclopaedia Britannica, 11th Edition, 1910/11. DIAMOND, a mineral universally recognized as chief among precious stones; it is the hardest, the most imperishable, and also the most brilliant of minerals. These qualities alone have made it supreme as a jewel since early times, and yet the real brilliancy of the stone is not displayed until it has been faceted by the art of the lapidary; and this was scarcely developed before the year 1746. The consummate hardness of the diamond, in spite of its high price, has made it most useful for purposes of grinding, polishing and drilling. Numerous attempts have been made to manufacture the diamond by artificial means, and these attempts have a high scientific interest on account of the mystery which surrounds the natural origin of this remarkable mineral. Its physical and chemical properties have been the subject of much study, and have a special interest in view of the extraordinary difference between the physical characters of the diamond and those of graphite (blacklead) or charcoal, with which it is chemically identical, and into which it can be converted by the action of heat or electricity. Again, on account of the great value of the diamond, much of the romance of precious stones has centred round this mineral; and the history of some of the great diamonds of historic times has been traced through many extraordinary vicissitudes. The name Άδάμας, “the invincible,” was probably applied by the Greeks to hard metals, and thence to corundum (emery) and other hard stones. According to Charles William King, the first undoubted application of the name to the diamond is found in Manilius (a.d. 16),—Sic Adamas, punctum lapidis, pretiosior auro,—and Pliny (a.d. 100) speaks of the rarity of the stone, “the most valuable of gems, known only to kings.” Pliny described six varieties, among which the Indian, having six pointed angles, and also resembling two pyramids (turbines, whip-tops) placed base to base, may probably be identified as the ordinary octahedral crystal (fig. 1). The “diamond” (Yahalom) in the breastplate of the high priest (Ex. xxxix. 11) was certainly some other stone, for it bore the name of a tribe, and methods of engraving the true diamond cannot have been known so early. The stone can hardly have become familiar to the Romans until introduced from India, where it was probably mined at a very early period. But one or other of the remaining varieties mentioned by Pliny (the Macedonian, the Arabian, the Cyprian, &c.) may be the true diamond, which was in great request for the tool of the gem-engraver. Later Roman authors mentioned various rivers in India as yielding the Adamas among their sands. The name Adamas became corrupted into the forms adamant, diamaunt, diamant, diamond; but the same word, owing to a medieval misinterpretation which derived it from adamare (compare the French word aimant), was also applied to the lodestone. Like all the precious stones, the diamond was credited with many marvellous virtues; among others the power of averting insanity, and of rendering poison harmless; and in the middle ages it was known as the “pietra della reconciliazione,” as the peacemaker between husband and wife. Scientific Characters.—The majority of minerals are found most commonly in masses which can with difficulty be recognized as aggregates of crystalline grains, and occur comparatively seldom as distinct crystals; but the diamond is almost always found in single crystals, which show no signs of previous attachment to any matrix; the stones were, until the discovery of the South African mines, almost entirely derived from sands or gravels, but owing to the hardness of the mineral it is rarely, if ever, water-worn, and the crystals are often very perfect. The crystals belong to the cubic system, generally assuming the form of the octahedron (fig. 1), but they may, in accordance with the principles of crystallography, also occur in other forms symmetrically derived from the octahedron,—for example, the cube, the 12-faced figure known as the rhombic dodecahedron (fig. 2), or the 48-faced figure known as the hexakis-octahedron (fig. 3), or in combinations of these. The octahedron faces are usually smooth; most of the other faces are rounded (fig. 4). The cube faces are rough with protruding points. The cube is sometimes found in Brazil, but is very rare among the S. African stones; and the dodecahedron is perhaps more common in Brazil than elsewhere. There is often a furrow running along the edges of the octahedron, or across the edges of the cube, and this indicates that the apparently simple crystal may really consist of eight individuals meeting at the centre; or, what comes to the same thing, of two individuals interpenetrating and projecting through each other. If this be so the form of the diamond is really the tetrahedron (and the various figures derived symmetrically from it) and not the octahedron. There are also twins of diamond in which two octahedra (fig. 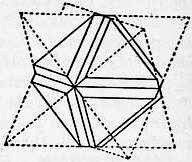 6) are united by contact along a surface parallel to an octahedron face without interpenetration. On account of their resemblance to the twins of the mineral spinel (which crystallizes in octahedra) these are known as “spinel twins.” They are generally flattened along the plane of union. The crystals often display triangular markings, either elevations or pits, upon the octahedron faces; the latter are particularly well defined and have the form of equilateral triangles (fig. 7). They are similar to the “etched figures” produced by moistening an octahedron of alum, and have probably been produced, like them, by the action of some solvent. Similar, but somewhat different markings are produced by the combustion of diamond in oxygen, unaccompanied by any rounding of the edges. Diamond possesses a brilliant “adamantine” lustre, but this tends to be greasy on the surface of the natural stones and gives 159 the rounded crystals somewhat the appearance of drops of gum. Absolutely colourless stones are not so common as cloudy and faintly coloured specimens; the usual tints are grey, brown, yellow or white; and as rarities, red, green, blue and black stones have been found. The colour can sometimes be removed or changed at a high temperature, but generally returns on cooling. It is therefore more probably due to metallic oxides than to hydrocarbons. Sir William Crookes has, however, changed a pale yellow diamond to a bluish-green colour by keeping it embedded in radium bromide for eleven weeks. The black coloration upon the surface produced by this process, as also by the electric bombardment in a vacuum tube, appears to be due to a conversion of the surface film into graphite. Diamond may break with a conchoidal fracture, but the crystals always cleave readily along planes parallel to the octahedron faces: of this property the diamond cutters avail themselves when reducing the stone to the most convenient form for cutting; a sawing process, has, however, now been introduced, which is preferable to that of cleavage. It is the hardest known substance (though tantalum, or an alloy of tantalum now competes with it) and is chosen as 10 in the mineralogist’s scale of hardness; but the difference in hardness between diamond (10) and corundum (9) is really greater than that between corundum (9) and talc (1); there is a difference in the hardness of the different faces; the Borneo stones are also said to be harder than those of Australia, and the Australian harder than the African, but this is by no means certain. The specific gravity ranges from 3.56 to 3.50, generally about 3.52. The coefficient of expansion increases very rapidly above 750°, and diminishes very rapidly at low temperatures; the maximum density is attained about −42° C.
The very high refractive power (index = 2.417 for sodium light) gives the stone its extraordinary brilliancy; for light incident within a diamond at a greater angle than 24½° is reflected back into the stone instead of passing through it; the corresponding angle for glass is 40½°. The very high dispersion (index for red light = 2.402, for blue light = 2.460) gives it the wonderful “fire” or display of spectral colours. Certain absorption bands at the blue end of the spectrum are supposed to be due to rare elements such as samarium. Unlike other cubic crystals, diamond experiences a diminution of refractive index with increase of temperature. It is very transparent for Röntgen rays, whereas paste imitations are opaque. It is a good conductor of heat, and therefore feels colder to the touch than glass and imitation stones. The diamond has also a somewhat greasy feel. The specific heat increases rapidly with rising temperature up to 60° C., and then more slowly. Crystals belonging to the cubic system should not be birefringent unless strained; diamond often displays double refraction particularly in the neighbourhood of inclusions, both liquid and solid; this is probably due to strain, and the spontaneous explosion of diamonds has often been observed. Diamond differs from graphite in being a bad conductor of electricity: it becomes positively electrified by friction. The electrical resistance is about that of ordinary glass, and is diminished by one-half during exposure by Röntgen rays; the dielectric constant (16) is greater than that which should correspond to the specific gravity. The phosphorescence produced by friction has been known since the time of Robert Boyle (1663); the diamond becomes luminous in a dark room after exposure to sunlight or in the presence of radium; and many stones phosphoresce beautifully (generally with a pale green light) when subjected to the electric discharge in a vacuum tube. Some diamonds are more phosphorescent than others, and different faces of a crystal may display different tints. The combustibility of the diamond was predicted by Sir Isaac Newton on account of its high refractive power; it was first established experimentally by the Florentine Academicians in 1694. In oxygen or air diamond burns at about 850°, and only continues to do so if maintained at a high temperature; but in the absence of oxidising agents it may be raised to a much higher temperature. It is, however, infusible at the temperature of the electric arc, but becomes converted superficially into graphite. Experiments on the combustion of diamond were made by Smithson Tennant (1797) and Sir Humphry Davy (1816), with the object of proving that it is pure carbon; they showed that burnt in oxygen it yields exactly the same amount of carbon dioxide as that produced by burning the same weight of carbon. Still more convincing experiments were made by A. Krause in 1890. Similarly Guyton de Morveau showed that, like charcoal, diamond converts soft iron into steel. Diamond is insoluble in acid and alkalis, but is oxidised on heating with potassium bichromate and sulphuric acid. Bort (or Boart) is the name given to impure crystals or fragments useless for jewels; it is also applied to the rounded crystalline aggregates, which generally have a grey colour, a rough surface, often a radial structure, and are devoid of good cleavage. They are sometimes spherical (“shot bort”). Carbonado or “black diamond,” found in Bahia (also recently in Minas Geraes), is a black material with a minutely crystalline structure somewhat porous, opaque, resembling charcoal in appearance, devoid of cleavage, rather harder than diamond, but of less specific gravity; it sometimes displays a rude cubic crystalline form. The largest specimen found (1895) weighed 3078 carats. Both bort and carbonado seem to be really aggregates of crystallized diamond, but the carbonado is so nearly structureless that it was till recently regarded as an amorphous modification of carbon. Uses of the Diamond.—The use of the diamond for other purposes than jewelry depends upon its extreme hardness: it has always been the only material used for cutting or engraving the diamond itself. The employment of powdered bort and the lapidary’s wheel for faceting diamonds was introduced by L. von Berquen of Bruges in 1476. Diamonds are now employed not only for faceting precious stones, but also for cutting and drilling glass, porcelain, &c,; for fine engraving such as scales; in dentistry for drilling; as a turning tool for electric-light carbons, hard rubber, &c.; and occasionally for finishing accurate turning work such as the axle of a transit instrument. For these tools the stone is actually shaped to the best form: it is now electroplated before being set in its metal mount in order to secure a firm fastening. It is also used for bearings in watches and electric meters. The best glaziers’ diamonds are chosen from crystals such that a natural curved edge can be used. For rock drills, and revolving saws for stone cutting, either diamond, bort or carbonado is employed, set in steel tubes, disks or bands. Rock drilling is the most important industrial application; and for this, owing to its freedom from cleavage, the carbonado is more highly prized than diamond; it is broken into fragments about 3 carats in weight; and in 1905 the value of carbonado was no less than from £10 to £14 a carat. It has been found that the “carbons” in drills can safely be subjected to a pressure of over 60 kilograms per square millimetre, and a speed of 25 metres per second. A recent application of the diamond is for wire drawing; a hole tapering towards the centre is drilled through a diamond, and the metal is drawn through this. No other tool is so endurable, or gives such uniform thickness of wire. Distribution and Mining.—The most important localities for diamonds have been: (1) India, where they were mined from the earliest times till the close of the 19th century; (2) South America, where they have been mined since the middle of the 18th century; and (3) South Africa, to which almost the whole of the diamond-mining industry has been transferred since 1870. India.—The diamond is here found in ancient sandstones and conglomerates, and in the river gravels and sands derived from them. The sandstones and conglomerates belong to the Vindhyan formation and overlie the old crystalline rocks: the diamantiferous beds are well defined, often not more than 1 ft. in thickness, and contain pebbles of quartzite, jasper, sandstone, slate, &c. The mines fall into five groups situated on the eastern side of the Deccan plateau about the following places (beginning from the south), the first three being in Madras. (1) Chennur near Cuddapah on the river Pennar. (2) Kurnool near Baneganapalle between the rivers Pennar and Kistna. (3) Kollar near Bezwada on the river Kistna. (4) Sambalpur on the river Mahanadi in the Central Provinces. (5) Panna near Allahabad, in Bundelkhand. The mining has always been carried on by natives of low caste, and by primitive methods which do not differ much from those described by the French merchant Jean Baptiste Tavernier (1605-1689), who paid a prolonged visit to most 160 of the mines between 1638 and 1665 as a dealer in precious stones. According to his description shallow pits were sunk, and the gravel excavated was gathered into a walled enclosure where it was crushed and water was poured over it, and it was finally sifted in baskets and sorted by hand. The buying and selling was at that period conducted by young children. In more modern times there has been the same excavation of shallow pits, and sluicing, sifting and sorting, by hand labour, the only machinery used being chain pumps made of earthen bowls to remove the water from the deeper pits. At some of the Indian localities spasmodic mining has been carried on at different periods for centuries, at some the work which had been long abandoned was revived in recent times, at others it has long been abandoned altogether. Many of the large stones of antiquity were probably found in the Kollar group, where Tavernier found 60,000 workers in 1645 (? ), the mines having, according to native accounts, been discovered about 100 years previously. Golconda was the fortress and the market for the diamond industry at this group of mines, and so gave its name to them. The old mines have now been completely abandoned, but in 1891 about 1000 carats were being raised annually in the neighbourhood of Hyderabad. The Sambalpur group appear to have been the most ancient mines of all, but they were not worked later than 1850. The Panna group were the most productive during the 19th century. India was no doubt the source of all the large stones of antiquity; a stone of 67 3⁄8 carats was found at Wajra Karur in the Chennur group in 1881, and one of 210½ carats at Hira Khund in 1809. Other Indian localities besides those mentioned above are Simla, in the N.W. Provinces, where a few stones have been found, and a district on the Gouel and the Sunk rivers in Bengal, which V. Ball has identified with the Soumelpour mentioned by Tavernier. The mines of Golconda and Kurnool were described as early as 1677 in the twelfth volume of the Philosophical Transactions of the Royal Society. At the present time very few Indian diamonds find their way out of the country, and, so far as the world’s supply is concerned, Indian mining of diamonds may be considered extinct. The first blow to this industry was the discovery of the Brazilian mines in Minas Geraes and Bahia. Brazil.—-Diamonds were found about 1725 at Tejuco (now Diamantina) in Minas Geraes, and the mining became important about 1740. The chief districts in Minas Geraes are (1) Bagagem on the W. side of the Serra da Mata da Corda; (2) Rio Abaete on the E. side of the same range; these two districts being among the head waters of the Rio de San Francisco and its tributaries; (3) Diamantina, on and about the watershed separating the Rio de San Francisco from the Rio Jequitinhonha; and (4) Grao Mogul, nearly 200 m. to the N.E. of Diamantina on the latter river. The Rio Abaete district was worked on a considerable scale between 1785 and 1807, but is now abandoned. Diamantina is at present the most important district; it occupies a mountainous plateau, and the diamonds are found both on the plateau and in the river valleys below it. The mountains consist here of an ancient laminated micaceous quartzite, which is in parts a flexible sandstone known as itacolumite, and in parts a conglomerate; it is interbedded with clay-slate, mica-schist, hornblende-schist and haematite-schist, and intersected by veins of quartz. This series is overlain unconformably by a younger quartzite of similar character, and itself rests upon the crystalline schists. The diamond is found under three conditions: (1) in the gravels of the present rivers, embedded in a ferruginous clay-cemented conglomerate known as cascalho; (2) in terraces (gupiarras) in a similar conglomerate occupying higher levels in the present valleys; (3) in plateau deposits in a coarse surface conglomerate known as gurgulho, the diamond and other heavy minerals being embedded in the red clay which cements the larger blocks. Under all these three conditions the diamond is associated with fragments of the rocks of the country and the minerals derived from them, especially quartz, hornstone, jasper, the polymorphous oxide of titanium (rutile, anatase and brookite), oxides and hydrates of iron (magnetite, ilmenite, haematite, limonite), oxide of tin, iron pyrites, tourmaline, garnet, xenotime, monazite, kyanite, diaspore, sphene, topaz, and several phosphates, and also gold. Since the heavy minerals of the cascalho in the river beds are more worn than those of the terraces, it is highly probable that they have been derived by the cutting down of the older river gravels represented by the terraces; and since in both deposits the heavy minerals are more abundant near the heads of the valleys in the plateau, it is also highly probable that both have really been derived from the plateau deposit. In the latter, especially at São João da Chapada, the minerals accompanying the diamond are scarcely worn at all; in the terraces and the river beds they are more worn and more abundant; the terraces, therefore, are to be regarded as a first concentration of the plateau material by the old rivers; and the cascalho as a second concentration by the modern rivers. The mining is carried on by negroes under the supervision of overseers; the cascalho is dug out in the dry season and removed to a higher level, and is afterwards washed out by hand in running water in shallow wooden basins (bateas). The terraces can be worked at all seasons, and the material is partly washed out by leading streams on to it. The washing of the plateau material is effected in reservoirs of rain water. It is difficult to obtain an estimate of the actual production of the Minas Geraes mines, for no official returns have been published, but in recent years it has certainly been rivalled by the yield in Bahia. The diamond here occurs in river gravels and sands associated with the same minerals as in Minas Geraes; since 1844 the richest mines have been worked in the Serra de Cincora, where the mountains are intersected by the river Paraguassu and its tributaries; it is said that there were as many as 20,000 miners working here in 1845, and it was estimated that 54,000 carats were produced in Bahia in 1858. The earlier workings were in the Serra de Chapada to the N.W. of the mines just mentioned. In 1901 there were about 5000 negroes employed in the Bahia mines; methods were still primitive; the cascalho was dug out from the river beds or tunnelled out from the valley side, and washed once a week in sluices of running water, where it was turned over with the hoe, and finally washed in wooden basins and picked over by hand; sometimes also the diamantiferous material is scooped out of the bed of the shallow rivers by divers, and by men working under water in caissons. It is almost exclusively in the mines of Bahia, and in particular in the Cincora district, that the valuable carbonado is found. The carbonado and the diamond have been traced to an extensive hard conglomerate which occurs in the middle of the sandstone formation. Diamonds are also mined at Salobro on the river Pardo not far inland from the port of Canavieras in the S.E. corner of Bahia. The enormous development of the South African mines, which supplied in 1906, about 90% of the world’s produce, has thrown into the shade the Brazilian production; but the Bulletin for Feb. 1909 of the International Bureau of American Republics gave a very confident account of its future, under improved methods. South Africa.—-The first discovery was made in 1867 by Dr W. G. Atherstone, who identified as diamond a pebble obtained from a child in a farm on the banks of the Orange river and brought by a trader to Grahamstown; it was bought for £500 and displayed in the Paris Exhibition of that year. In 1869 a stone weighing 83½ carats was found near the Orange river; this was purchased by the earl of Dudley for £25,000 and became famous as the “Star of South Africa.” A rush of prospectors at once took place to the banks of the Orange and Vaal rivers, and resulted in considerable discoveries, so that in 1870 there was a mining camp of no less than 10,000 persons on the “River Diggings.” In the River Diggings the mining was carried on in the coarse river gravels, and by the methods of the Brazilian negroes and of gold placer-miners. A diggers’ committee limited the size of claims to 30 ft. square, with free access to the river bank; the gravel and sand were washed in cradles provided with screens of perforated metal, and the concentrates were sorted by hand on tables by means of an iron scraper. But towards the close of 1870 stones were found at Jagersfontein and at Dutoitspan, far from the Vaal river, and led to a second great rush of prospectors, especially to Dutoitspan, and in 1871 to what is now the Kimberley mine in the neighbourhood of the latter. At each of these spots the diamantiferous area was a roughly circular patch of considerable size, and in some occupied the position of one of those depressions or “pans” so frequent in S. Africa. These “dry diggings” were therefore at first supposed to be alluvial in origin like the river gravels; but it was soon discovered that, below the red surface soil and the underlying calcareous deposit, diamonds were also found in a layer of yellowish clay about 50 ft. thick known as “yellow ground.” Below this again was a hard bluish-green serpentinous rock which was at first supposed to be barren bed-rock; but this also contained the precious stone, and has become famous, under the name of “blue ground,” as the matrix of the S. African diamonds. The yellow ground is merely decomposed blue ground. In the Kimberley district five of these round patches of blue ground were found within an area little more than 3 m. in diameter; that at Kimberley occupying 10 acres, that at Dutoitspan 23 acres. There were soon 50,000 workers on this field, the canvas camp was replaced by a town of brick and iron surrounded by the wooden huts of the natives, and Kimberley became an important centre. It was soon found that each mine was in reality a huge vertical funnel or crater descending to an unknown depth, and filled with diamantiferous blue ground. At first each claim was an independent pit 31 ft. square sunk into the blue ground; the diamantiferous rock was hoisted by bucket and windlass, and roadways were left across the pit to provide access to the claims. But the roadways soon fell in, and ultimately haulage from the claims could only be provided by means of a vast system of wire ropes extending from a triple staging of windlasses erected round the entire edge of the mine, which had by this time become a huge open pit; the ropes from the upper windlasses extended to the centre, and those from the lower tier to the sides of the pit; covering the whole mass like a gigantic cobweb. (See Plate II. fig. 12.) The buckets of blue ground were hauled up these ropes by means of horse whims, and in 1875 steam winding engines began to be employed. By this time also improved methods in the treatment of the blue ground were introduced. It was carried off in carts to open spaces, where an exposure of some weeks to the air was found to pulverize the hard rock far more efficiently than the old method of crushing with mallets. The placer-miner’s cradle and rocking-trough were replaced by puddling troughs stirred by a revolving comb worked by horse power; reservoirs were constructed for the scanty water-supply, bucket elevators were introduced to carry away the tailings; and the natives were confined in compounds. For these improvements co-operation was necessary; the better claims, which in 1872 had risen from £100 to more than £4000 in value, began to be consolidated, and a Mining Board was introduced. The scene of native mining was now transferred from the open pit to underground tunnels; the vast network of wire ropes (Plate II. fig. 12) with their ascending and descending buckets disappeared, and with it the cosmopolitan crowd of busy miners working like ants at the bottom of the pit. In place of all this, the visitor to Kimberley encounters at the edge of the town only a huge crater, silent and apparently deserted, with no visible sign of the great mining operations which are conducted nearly half a mile below the surface. The aspect of the Kimberley pit in 1906 is shown in fig. 13 of Plate II., which may be compared with the section of fig. 8. In fig. 13, Plate II., the sequence of the basalt, shale and melaphyre is clearly visible on the sides of the pit; and fig. 8 shows how the crater or “pipe” of blue ground has penetrated these rocks and also the underlying quartzite. The workings at De Beers had extended into the still more deeply seated granite in 1906. Figure 9, Plate I., shows the top of the De Beers’ crater with basalt overlying the shale. Figure 8 also explains the modern system of mining introduced by Gardner Williams. A vertical shaft is sunk in the vicinity of the mine, and from this horizontal tunnels are driven into the pipe at different levels separated by intervals of 40 ft. Through the blue ground itself on each level a series of parallel tunnels about 120 ft. apart are driven to the opposite side of the pipe, and at right angles to these, and 36 ft. apart, another series of tunnels. When the tunnels reach the side of the mine they are opened upwards and sideways so as to form a large chamber, and the overlying mass of blue ground and débris is allowed to settle down and fill up the gallery. On each level this process is carried somewhat farther back than on the level below (fig. 8); material is thus continually withdrawn from one side of the mine and extracted by means of the rock shaft on the opposite side, while the superincumbent débris is continually sinking, and is allowed to fall deeper on the side farthest from the shaft as the blue ground is withdrawn from beneath it. In 1905 the main shaft had been sunk to a depth of 2600 ft. at the Kimberley mine. For the extraction and treatment of the blue ground the De Beers Company in its great winding and washing plant employs labour-saving machinery on a gigantic scale. The ground is transferred in trucks to the shaft where it is automatically tipped into skips holding 96 cubic ft. (six truck loads); these are rapidly hoisted to the surface, where their contents are automatically dumped into side-tipping trucks, and these in turn are drawn away in a continual procession by an endless wire rope along the tram lines leading to the vast “distributing floors.” These are open tracts upon which the blue ground is spread out and left exposed to sun and rain until it crumbles and disintegrates, the process being hastened by harrowing with steam ploughs; this may require a period of three or six months, or even a year. The stock of blue ground on the floors at one time in 1905 was nearly 4,500,000 loads. The disintegrated ground is then brought back in the trucks and fed through perforated cylinders into the washing pans; the hard blue which has resisted disintegration on the floors, and the lumps which are too big to pass the cylindrical sieves, are crushed before going to the pans. These are shallow cylindrical troughs containing muddy water in which the diamonds and other heavy minerals (concentrates) are swept to the rim by revolving toothed arms, while the lighter stuff escapes near the centre of the pan. The concentrates are then passed over sloping tables (pulsator) and shaken to and fro under a stream of water which effects a second concentration of the heaviest material. Until recently the final separation of the diamond from the concentrates was made by hand picking, but even this has now been replaced by machinery, owing to the remarkable discovery that a greased surface will hold a diamond while allowing the other heavy minerals to pass over it. The concentrates are washed down a sloping table of corrugated iron which is smeared with grease, and it is found that practically all the diamonds adhere to the table, and the other minerals are washed away. At the large and important Premier mine in the Transvaal the Elmore process, used in British Columbia and in Wales for the separation of metallic ores, has been also introduced. In the Elmore process oil is employed to float off the materials which adhere to it, while the other materials remain in the water, the oil being separated from the water by centrifugal action. The other minerals found in the concentrates are pebbles and fragments of pyrope, zircon, cyanite, chrome-diopside, enstatite, a green pyroxene, mica, ilmenite, magnetite, chromite, hornblende, olivine, barytes, calcite and pyrites. In all the S. African mines the diamonds are not only crystals of various weights from fractions of a carat to 150 carats, but also occur as microscopic crystals disseminated through the blue ground. In spite of this, however, the average yield in the profitable mines is only from 0.2 carat to 0.6 carat per load of 1600 lb, or on an average about 1½ grs. per ton. The annual output of diamonds from the De Beers mines was valued in 1906 at nearly £5,000,000; the value per carat ranging from about 35s. to 70s. Pipes similar to those which surround Kimberley have been found in other parts of S. Africa. One of the best known is that of Jagersfontein, which was really the first of the dry diggings (discovered in 1870). This large mine is near Fauresmith and 80 m. to the south of Kimberley. In 1905 the year’s production from the Orange River Colony mines was more than 320,000 carats, valued at £938,000. But by far the largest of all the pipes hitherto discovered is the Premier mine in the Transvaal, about 300 m. to the east of Kimberley. This was discovered in 1902 and occupies an area of about 75 acres. In 1906 it was being worked as a shallow open mine; but the description of the Kimberley methods given above is applicable to the washing plant at that time being introduced into the Premier mine upon a very large scale. Comparatively few of the pipes which have been discovered are at all rich in diamonds, and many are quite barren; some are filled with “hard blue” which even if diamantiferous may be too expensive to work. The most competent S. African geologists believe all these remarkable pipes to be connected with volcanic outbursts which occurred over the whole of S. Africa during the Cretaceous period (after the deposition of the Stormberg beds), and drilled these enormous craters through all the later formations. With the true pipes are associated dykes and fissures also filled with diamantiferous blue ground. It is only in the more northerly part of the country that the pipes are filled with blue ground (or “kimberlite”), and that they are diamantiferous; but over a great part of Cape Colony have been discovered what are probably similar pipes filled with agglomerates, breccias and tuffs, and some with basic lavas; one, in particular, in the Riversdale Division near the southern coast, being occupied by a melilite-basalt. It is quite clear that the occurrence of the diamond in the S. African pipes is quite different from the occurrences in alluvial deposits which have been described above. The question of the origin of the diamond in S. Africa and elsewhere is discussed below. The River Diggings on the Vaal river are still worked upon a small scale, but the production from this source is so limited that they are of little account in comparison with the mines in the blue ground. The stones, however, are good; since they differ somewhat from the Kimberley crystals it is probable that they were not derived from the present pipes. Another S. African locality must be mentioned; considerable finds were reported in 1905 and 1906 from gravels at Somabula near Gwelo in Rhodesia where the diamond is associated with chrysoberyl, corundum (both sapphire and ruby), topaz, garnet, ilmenite, staurolite, rutile, with pebbles of quartz, granite, 162 chlorite-schist, &c. Diamond has also been reported from kimberlite “pipes” in Rhodesia. Other Localities.—In addition to the South American localities mentioned above, small diamonds have also been mined since their discovery in 1890 on the river Mazaruni in British Guiana, and finds have been reported in the gold washings of Dutch Guiana. Borneo has possessed a diamond industry since the island was first settled by the Malays; the references in the works of Garcia de Orta, Linschoten, De Boot, De Laet and others, to Malacca as a locality relate to Borneo. The large Borneo stone, over 360 carats in weight, known as the Matan, is in all probability not a diamond. The chief mines are situated on the river Kapuas in the west and near Bandjarmassin in the south-east of the island, and the alluvial deposits in which they occur are worked by a small number of Chinese and Malays. Australia has yielded diamonds in alluvial deposits near Bathurst (where the first discovery was made in 1851) and Mudgee in New South Wales, and also near Bingara and Inverell in the north of the colony. At Mount Werong a stone weighing 29 carats was found in 1905. At Ruby Hill near Bingara they were found in a breccia filling a volcanic pipe. At Ballina, in New England, diamonds have been found in the sea sand. Other Australian localities are Echunga in South Australia; Beechworth, Arena and Melbourne in Victoria; Freemantle and Nullagine in Western Australia; the Palmer and Gilbert rivers in Queensland. These have been for the most part discoveries in alluvial deposits of the goldfields, and the stones were small. In Tasmania also diamonds have been found in the Corinna goldfields. Europe has produced few diamonds. Humboldt searched for them in the Urals on account of the similarity of the gold and platinum deposits to those of Brazil, and small diamonds were ultimately found (1829) in the gold washings of Bissersk, and later at Ekaterinburg and other spots in the Urals. In Lapland they have been found in the sands of the Pasevig river. Siberia has yielded isolated diamonds from the gold washings of Yenisei. In North America a few small stones have been found in alluvial deposits, mostly auriferous, in Georgia, N. and S. Carolina, Kentucky, Virginia, Tennessee, Wisconsin, California, Oregon and Indiana. A crystal weighing 23¾ carats was found in Virginia in 1855, and one of 21¼ carats in Wisconsin in 1886. In 1906 a number of small diamonds were discovered in an altered peridotite somewhat resembling the S. African blue ground, at Murfreesboro, Pike county, Arkansas. Considerable interest attaches to the diamonds found in Wisconsin, Michigan and Ohio near the Great Lakes, for they are here found in the terminal moraines of the great glacial sheet which is supposed to have spread southwards from the region of Hudson Bay; several of the drift minerals of the diamantiferous region of Indiana have been identified as probably of Canadian origin; no diamonds have however yet been found in the intervening country of Ontario. A rock similar to the blue ground of Kimberley has been found in the states of Kentucky and New York. The occurrence of diamond in meteorites is described below. Origin of the Diamond in Nature.—It appears from the foregoing account that at most localities the diamond is found in alluvial deposits probably far from the place where it originated. The minerals associated with it do not afford much clue to the original conditions; they are mostly heavy minerals derived from the neighbouring rocks, in which the diamond itself has not been observed. Among the commonest associates of the diamond are quartz, topaz, tourmaline, rutile, zircon, magnetite, garnet, spinel and other minerals which are common accessory constituents of granite, gneiss and the crystalline schists. Gold (also platinum) is a not infrequent associate, but this may only mean that the sands in which the diamond is found have been searched because they were known to be auriferous; also that both gold and diamond are among the most durable of minerals and may have survived from ancient rocks of which other traces have been lost. The localities at which the diamond has been supposed to occur in its original matrix are the following:—at Wajra Karur, in the Cuddapah district, India, M. Chaper found diamond with corundum in a decomposed red pegmatite vein in gneiss. At Sāo João da Chapada, in Minas Geraes, diamonds occur in a clay interstratified with the itacolumite, and are accompanied by sharp crystals of rutile and haematite in the neighbourhood of decomposed quartz veins which intersect the itacolumite. It has been suggested that these three minerals were originally formed in the quartz veins. In both these occurrences the evidence is certainly not sufficient to establish the presence of an original matrix. At Inverell in New South Wales a diamond (1906) has been found embedded in a hornblende diabase which is described as a dyke intersecting the granite. Finally there is the remarkable occurrence in the blue ground of the African pipes. There has been much controversy concerning the nature and origin of the blue ground itself; and even granted that (as is generally believed) the blue ground is a much serpentinized volcanic breccia consisting originally of an olivine-bronzite-biotite rock (the so-called kimberlite), it contains so many rounded and angular fragments of various rocks and minerals that it is difficult to say which of them may have belonged to the original rock, and whether any were formed in situ, or were brought up from below as inclusions. Carvill Lewis believed the blue ground to be true eruptive rock, and the carbon to have been derived from the bituminous shales of which it contains fragments. The Kimberley shales, which are penetrated by the De Beers group of pipes, were, however, certainly not the source of the carbon at the Premier (Transvaal) mine, for at this locality the shales do not exist. The view that the diamond may have crystallized out from solution in its present matrix receives some support from the experiments of W. Luzi, who found that it can be corroded by the solvent action of fused blue ground; from the experiments of J. Friedländer, who obtained diamond by dissolving graphite in fused olivine; and still more from the experiments of R. von Hasslinger and J. Wolff, who have obtained it by dissolving graphite in a fused mixture of silicates having approximately the composition of the blue ground. E. Cohen, who regarded the pipes as of the nature of a mud volcano, and the blue ground as a kimberlite breccia altered by hydrothermal action, thought that the diamond and accompanying minerals had been brought up from deep-seated crystalline schists. Other authors have sought the origin of the diamond in the action of the hydrated magnesian silicates on hydrocarbons derived from bituminous schists, or in the decomposition of metallic carbides. Of great scientific interest in this connexion is the discovery of small diamonds in certain meteorites, both stones and irons; for example, in the stone which fell at Novo-Urei in Penza, Russia, in 1886, in a stone found at Carcote in Chile, and in the iron found at Cañon Diablo in Arizona. Graphitic carbon in cubic form (cliftonite) has also been found in certain meteoric “irons,” for example in those from Magura in Szepes county, Hungary, and Youndegin near York in Western Australia. The latter is now generally believed to be altered diamond. The fact that H. Moissan has produced the diamond artificially, by allowing dissolved carbon to crystallize out at a high temperature and pressure from molten iron, coupled with the occurrence in meteoric iron, has led Sir William Crookes and others to conclude that the mineral may have been derived from deep-seated iron containing carbon in solution (see the article Gem, Artificial). Adolf Knop suggested that this may have first yielded hydrocarbons by contact with water, and that from these the crystalline diamond has been formed. The meteoric occurrence has even suggested the fanciful notion that all diamonds were originally derived from meteorites. The meteoric iron of Arizona, some of which contains diamond, is actually found in and about a huge crater which is supposed by some to have been formed by an immense meteorite penetrating the earth’s crust. It is, at any rate, established that carbon can crystallize as diamond from solution in iron, and other metals; and it seems that high temperature and pressure and the absence of oxidizing agents are necessary conditions. The presence of sulphur, nickel, &c., in the iron appears to favour the production of the diamond. On the other hand, the occurrence in meteoric stones, and the experiments mentioned above, show that the diamond may also crystallize from a basic magma, capable of yielding some of the metallic oxides and ferro-magnesian silicates; a magma, therefore, which is not devoid of oxygen. This is still more forcibly suggested by the remarkable eclogite boulder found in the blue ground of the Newlands mine, not far from the Vaal river, and described by T. G. Bonney. The boulder is a crystalline rock consisting of pyroxene (chrome-diopside), garnet, and a little olivine, and is studded with diamond crystals; a portion of it is preserved in the British Museum (Natural History). In another eclogite boulder, diamond was found partly embedded in pyrope. Similar boulders have also been found in the blue ground elsewhere. Specimens of pyrope with attached or embedded diamond had previously been found in the blue ground of the De Beers mines. In the Newlands boulder the diamonds have the appearance of being an original constituent of the eclogite. It seems therefore that a holocrystalline pyroxene-garnet rock may be one source of the diamond found in blue ground. On the other hand many tons of the somewhat similar eclogite in the De Beers mine have been crushed and have not yielded diamond. Further, the ilmenite, which is the most characteristic associate of the diamond in blue ground, and other of the accompanying minerals, may have come from basic rocks of a different nature. The Inverell occurrence may prove to be another example of diamond crystallized from a basic rock. In both occurrences, however, there is still the possibility that the eclogite or the basalt is not the original matrix, but may have caught up the already formed diamond from some other matrix. Some regard the eclogite boulders as derived from deep-seated crystalline rocks, others as concretions in the blue ground. None of the inclusions in the diamond gives any clue to its origin; diamond itself has been found as an inclusion, as have also black specks of some carbonaceous materials. Other black specks have been identified as haematite and ilmenite; gold has also been found; other included minerals recorded are rutile, topaz, quartz, pyrites, apophyllite, and green scales of chlorite (?). Some of these are of very doubtful identification; others (e.g. apophyllite and chlorite) may have been introduced along cracks. Some of the fibrous inclusions were identified by H. R. Göppert as vegetable structures and were supposed to point to an organic origin, but this view is no longer held. Liquid inclusions, some of which are certainly carbon dioxide, have also been observed. Finally, then, both experiment and the natural occurrence in rocks and meteorites suggest that diamond may crystallize not only from iron but also from a basic silicate magma, possibly from various rocks consisting of basic silicates. The blue ground of S. Africa may be the result of the serpentinization of several such rocks, and although now both brecciated and serpentinized some of these may have been the original matrix. A circumstance often mentioned in support of this view is the fact that the diamonds in one pipe generally differ somewhat in character from those of another, even though they be near neighbours. History.—All the famous diamonds of antiquity must have been Indian stones. The first author who described the Indian mines at all fully was the Portuguese, Garcia de Orta (1565), who was physician to the viceroy of Goa. Before that time there were only legendary accounts like that of Sindbad’s “Valley of the Diamonds,” or the tale of the stones found in the brains of serpents. V. Ball thinks that the former legend originated in the Indian practice of sacrificing cattle to the evil spirits when a new mine is opened; birds of prey would naturally carry off the flesh, and might give rise to the tale of the eagles carrying diamonds adhering to the meat. A large stone found in the Golconda mines and said to have weighed 787 carats in the rough, before being cut by a Venetian lapidary, was seen in the treasury of Aurangzeb in 1665 by Tavernier, who estimated its weight after cutting as 280 (?) carats, and described it as a rounded rose-cut-stone, tall on one side. The name Great Mogul has been frequently applied to this stone. Tavernier states that it was the famous stone given to Shah Jahan by the emir Jumla. The Orloff, stolen by a French soldier from the eye of an idol in a Brahmin temple, stolen again from him by a ship’s captain, was bought by Prince Orloff for £90,000, and given to the empress Catharine II. It weighs 194¾ carats, is of a somewhat yellow tinge, and is among the Russian crown jewels. The Koh-i-nor, which was in 1739 in the possession of Nadir Shah, the Persian conqueror, and in 1813 in that of the raja of Lahore, passed into the hands of the East India Company and was by them presented to Queen Victoria in 1850. It then weighed 186 1⁄16 carats, but was recut in London by Amsterdam workmen, and now weighs 106 1⁄16 carats. There has been much discussion concerning the possibility of this stone and the Orloff being both fragments of the Great Mogul. The Mogul Baber in his memoirs (1526) relates how in his conquest of India he captured at Agra the great stone weighing 8 mishkals, or 320 ratis, which may be equivalent to about 187 carats. The Koh-i-nor has been identified by some authors with this stone and by others with the stone seen by Tavernier. 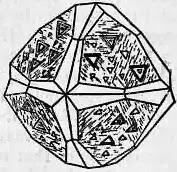 Tavernier, however, subsequently described and sketched the diamond which he saw as shaped like a bisected egg, quite different therefore from the Koh-i-nor. Nevil Story Maskelyne has shown reason for believing that the stone which Tavernier saw was really the Koh-i-nor and that it is identical with the great diamond of Baber; and that the 280 carats of Tavernier is a misinterpretation on his part of the Indian weights. He suggests that the other and larger diamond of antiquity which was given to Shah Jahan may be one which is now in the treasury of Teheran, and that this is the true Great Mogul which was confused by Tavernier with the one he saw. (See Ball, Appendix I. to Tavernier’s Travels (1889); and Maskelyne, Nature, 1891, 44, p. 555.). The Regent or Pitt diamond is a magnificent stone found in either India or Borneo; it weighed 410 carats and was bought for £20,400 by Pitt, the governor of Madras; it was subsequently, in 1717, bought for £80,000 (or, according to some authorities, £135,000) by the duke of Orleans, regent of France; it was reduced by cutting to 13614⁄16 carats; was stolen with the other crown jewels during the Revolution, but was recovered and is still in France. The Akbar Shah was originally a stone of 116 carats with Arabic inscriptions engraved upon it; after being cut down to 71 carats it was bought by the gaikwar of Baroda for £35,000. The Nizam, now in the possession of the nizam of Hyderabad, is supposed to weigh 277 carats; but it is only a portion of a stone which is said to have weighed 440 carats before it was broken. The Great Table, a rectangular stone seen by Tavernier in 1642 at Golconda, was found by him to weigh 242 3⁄16 carats; Maskelyne regards it as identical with the Darya-i-nur, which is also a rectangular stone weighing about 186 carats in the possession of the shah of Persia. Another stone, the Taj-e-mah, belonging to the shah, is a pale rose pear-shaped stone and is said to weigh 146 carats. Other famous Indian diamonds are the following:—The Sancy, weighing 531 2⁄16 carats, which is said to have been successively the property of Charles the Bold, de Sancy, Queen Elizabeth, Henrietta Maria, Cardinal Mazarin, Louis XIV. ; to have been stolen with the Pitt during the French Revolution; and subsequently to have been the property of the king of Spain, Prince Demidoff and an Indian prince. The Nassak, 78 5⁄8 carats, the property of the duke of Westminster. The Empress Eugénie, 51 carats, the property of the gaikwar of Baroda. The Pigott, 49 carats(? ), which cannot now be traced. The Pasha, 40 carats. The White Saxon, 48¾ carats. The Star of Este, 251 3⁄32 carats. Coloured Indian diamonds of large size are rare; the most famous are:—a beautiful blue brilliant, 672⁄16 carats, cut from a stone weighing 112 3⁄16 carats brought to Europe by Tavernier. It was stolen from the French crown jewels with the Regent and was never recovered. The Hope, 44¼ carats, has the same colour and is probably a portion of the missing stone: it was so-called as forming part of the collection of H. T. Hope (bought for £18,000), and was sold again in 1906 (resold 1909). Two other blue diamonds are known, weighing 13¾ and 1¾ carats, which may also be portions of the French diamond. The Dresden Green, one of the Saxon crown jewels, 40 carats, has a fine apple-green colour. The Florentine, 133 1⁄5 carats, one of the Austrian crown jewels, is a very pale yellow. The most famous Brazilian stones are:—The Star of the South, found in 1853, when it weighed 254½ carats and was sold for £40,000; when cut it weighed 125 carats and was bought by the gaikwar of Baroda for £80,000. Also a diamond belonging to Mr Dresden, 119 carats before, and 76½ carats after cutting. Many large stones have been found in South Africa; some are yellow but some are as colourless as the best Indian or Brazilian stones. The most famous are the following:—the Star of South Africa, or Dudley, mentioned above, 83½ carats rough, 46½ carats cut. The Stewart, 288 3⁄8 carats rough, 120 carats cut. Both these were found in the river diggings. The Porter Rhodes from Kimberley, of the finest water, weighed about 150 carats. The Victoria, 180 carats, was cut from an octahedron weighing 457½ carats, and was sold to the nizam of Hyderabad for £400,000. The Tiffany, a magnificent orange-yellow stone, weighs 125½ carats cut. A yellowish octahedron found at De Beers weighed 428½ carats, and yielded a brilliant of 288½ carats. Some of the finest and largest stones have come from the Jagersfontein mine; one, the Jubilee, found in 1895, weighed 640 carats in the rough and 239 carats when cut. Until 1905 the largest known diamond in the world was the Excelsior, found in 1893 at Jagersfontein by a native while loading a truck. It weighed 971 carats, and was ultimately cut into ten stones weighing from 68 to 13 carats. But all previous records were surpassed in 1905 by a magnificent stone more than three times the size of any known diamond, which was found in the yellow ground at the newly discovered Premier mine in the Transvaal. This extraordinary diamond weighed 3025¾ carats (1 1⁄3 lb) and was clear and water white; the largest of its surfaces appeared to be a cleavage plane, so that it might be only a portion of a much larger stone. It was known as the Cullinan Diamond. This stone was purchased by the Transvaal government in 1907 and presented to King Edward VII. It was sent to Amsterdam to be cut, and in 1908 was divided into nine large stones and a number of small brilliants. The four largest stones weigh 516½ carats, 309 3⁄16 carats, 92 carats and 62 carats respectively. Of these the first and second are the largest brilliants in existence. All the stones are flawless and of the finest quality.